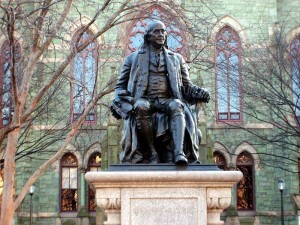 Benjamin Franklin is ubiquitous at the University of Pennsylvania. The University of Pennsylvania, one of the eight Ivy League colleges, is a private institution in spite of its name. Located in Philadelphia, PA, an historic, vibrant, cultural, and diverse city, Penn is the fifth oldest post-secondary institution in the United States. Approximately 12,000 undergraduates attend Penn. 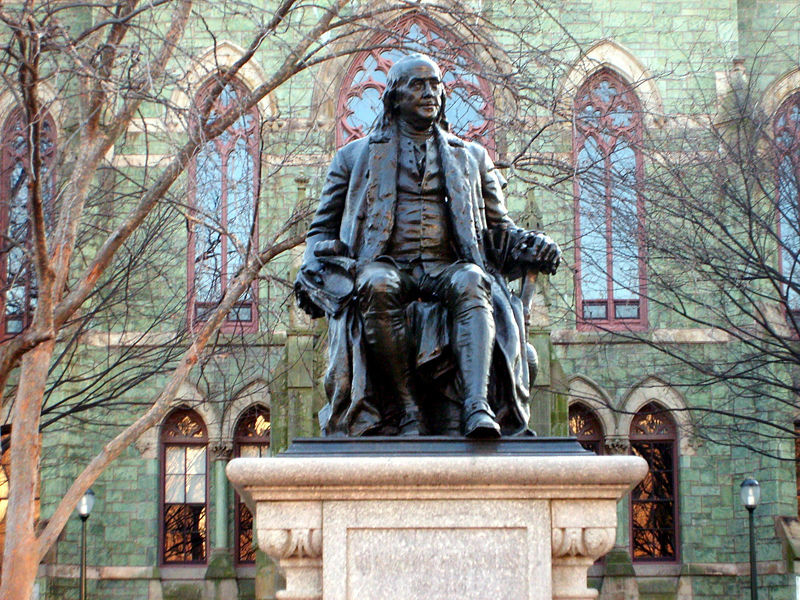 Founded by Benjamin Franklin in 1749, the University of Pennsylvania, first named as the Academy and College of Philadelphia, was established on the concept that while an undergraduate education should certainly focus on theoretical aspects, it should also have practical implications. To this day, Penn continues the spirit of its founding fathers, and its graduates are among the most career-oriented of all the Ivy League colleges. Penn consists of twelve schools and undergraduate programs are offered in four of these schools: The College of Arts and Sciences, the School of Engineering and Applied Science (SEAS), the School of Nursing (the only Ivy League institution to offer a nursing school), and the Wharton School (the only Ivy League institution to offer a business school). As a graduate school, Penn has a medical, law, business, dental, nursing, and veterinary school. With Nobel laureates as professors, it’s no surprise that Penn is an academic powerhouse with world-class research opportunities. In addition, Penn offers six specialized dual-degree and interdisciplinary programs: The Jerome Fisher Program in Management and Technology (a B.S. in Economics from the Wharton School and either a BSE in Engineering or a BAS in Engineering from Penn Engineering), the Huntsman Program in International Studies and Business (a B.A. in International Studies from the School of Arts and Sciences and a B.S. in Economics from the Wharton School), Nursing and Health Care Management (a B.S. from Penn Nursing Science and a B.S. in Economics from The Wharton School), The Roy and Diana Vagelos Program in Life Sciences and Management (a B.S. in Economics from the Wharton School and a B.A. from the College of Arts & Sciences in a life science discipline), the Vagelos Integrated Program in Energy Research (VIPER) (a bachelor’s degree from the College of Arts and Sciences and the School of Engineering and Applied Science), and the Accelerated 7 year Bio-Dental Program (a bachelor’s degree plus a dental degree from Penn Dental Medicine). Throwing toast onto Franklin Field, not stepping foot on the compass for fear of failing your freshman midterm exams, Hey Day, Penn Relays, Spring Fling, and a host of other activities help make the University of Pennsylvania rich in its traditions. From Penn’s Academically Based Community Service (ABCS) courses which combine theory and practice through activities that make a difference in public schools, churches, synagogues, and outreach centers in the West Philadelphia communities to Penntoring to Kite and Key, giving back to the surrounding Philadelphia community is a big deal at Penn. For the Class of 2019, the University of Pennsylvania Admissions department received 37,267 applications – the most applications in Penn’s history – and accepted 3,697 candidates. This left the overall University of Pennsylvania admissions rate at 9.9%.